Mulfran Press is based in Cardiff, Wales. It publishes poetry collections and pamphlets, as well as essay pamphlets on topics in poetics. Mulfran books and pamphlets are sold through bookshops and through bookshops' web sites; if not in stock, bookshops can order them for customers via TeleOrdering. Or, you may get them more quickly by post from us at Mulfran Press, 2 Aber Street, Cardiff CF11 7AG. When ordering direct from us, please enclose a cheque drawn in British Pounds Sterling to Mulfran Press for the full cover price; we do not charge postage. Facilities for ordering from us online will be provided in the future. Mulfran Press books are listed on Amazon as not alvailable because Mulfran cannot afford Amazon's terms and conditions for selling via them. Your local bookshop will ordinarily be happy to order our books for you and some bookshops stock selected Mulfran books and / or pamphlets. Mulfran Press books are also available from Blackwell. For more information, see Blackwell Bookshop Online and search for any of our books. On the full page [via title or "More" link] for any of our books is a link for Mulfran Press that will bring up a list of all our books offered by Blackwell. If you require further information about this or other matters, send your questions to queries@mulfran.co.uk. We like  and read  a very wide variety of poetry, much of it contemporary, and most of it from the 20th and 21st centuries; we also appreciate the poetry of earlier periods, and have an interest in the poetry of other languages, usually as represented in translation. We provide examples and recommended reading. Have a look! Mulfran (pronounced meel-vran, accent on the first syllable) is a Welsh word for cormorant. Mulfran Press was started in the docks area of Cardiff, where numerous cormorants can be observed diving, perching and spreading their wings. To get a feel for how Mulfran sees cormorants, read Amy Clampitt's poem, "The Cormorant in its Element"on Gritfish.com. From 22 November 2013 a new short story will be posted here each month. This first story, Two Novembers by Frances Hay, is particularly appropriate for this date. A Christmas story is planned for December. Helen Lovelock-Burke, Michael Arnold Williams, and Mulfran Press celebrated the publication of Helen’s book Dayship and Michael’s book The Acolytes. There were readings from their books and by special guest poet Richard Price. Lesley Saunders, poem 'Germ Theory' chosen for Poetry Society Autumn 2011 Members Poems. The poem and others by her are linked from here on the Poetry Society site. We regret that until further notice, Mulfran cannot consider any manuscripts other than those already received or invited. Maureen Jivani's Insensible Heart has been shortlisted for the London Festival Fringe New Poetry Award 2010. 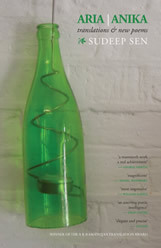 This award, judged this year by Daljit Nagra, Tamar Yoseloff and Adam O'Rordan, celebrates poets' first collections. The winner was announced in August: Carrie Etters' The Tethers. The prize is organised by the London Festival Fringe in conjuction with Cegin Productions and Coffee-House Poetry at the Troubadour. See the Coffee-House Poetry web site for further information. The sequence Some Languages Are Hard To Dream In (first published in No Doves) is now released as a pamphlet, number five in the Mulfran Miniatures series, accompanied by specially commissioned images by Christopher Hedley-Dent. Launched with an accompanying dance performance by Liza Wedgwood at the Glanfa Stage, Wales Millennium Centre, 6pm 11 July 2010. Peter Daniels won first prize in the 2010 TLS poetry competition with his poem "The Pump". All Mulfran Press titles were stocked at Windsor Bookshop, 9A Windsor Road, Penarth CF64 1JB. This bookshop is now open under new management and with a new name: Griffin Books. I hope that Mulfran books will be stocked there in the future. A Friends Meeting House in East London hosted the first launch of the first four in the Mulfran Miniatures series of illustrated pamphlets, as well as Maureen Jivani's Insensible Heart). The room was full to overflowing, and all the readers received an enthusiastic response. A further reading on 8th June 2010 at the Wales Millennium Centre, Cardiff, launched Ashes of a Valleys Childhood by Lynda Nash (illustrated with period photographs from the '60s and '70s) and the pamplets: Roy Morgans' The Sychbant, illustrated by Marion K V Kenning; Peter Daniels' Work & Food, illustrated by Moira Coupe; Malcolm Lewis' The Hard Man, with two Ceri Richards drawings as illustration; Maureen Jivani's My Shinji Noon (first published by Mulfran in Insensible Heart), illustrated by Jill Schoenmann. An audience of about 50 enjoyed an exciting mix of talents from South Wales, Trethomas, Merthyr Tydfil, Caerphilly, Penarth and further afield. This event was supported by Academi (now known as Literature Wales). The launch of Duncan McGibbon'sThe Consolations was held Saturday 9 January 2010 at the Bath Royal Literary & Scientific Institution (BRLSI) in Bath. Light refreshments & a glass of wine or soft drink were provided courtesy of Mulfran Press, and books were sold at the special launch price of £7.00. Although the weather prevented a number of people from being able to attend, there was a good crowd and it was a most enjoyable occasion. 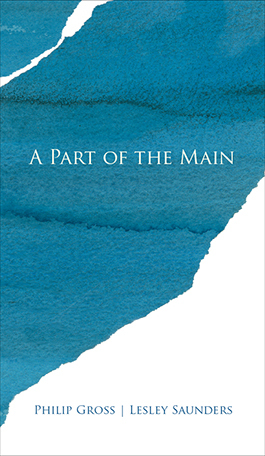 A Part of the Main by Lesley Saunders and Philip Gross. £14. This important long poem is published as an attractive 60-page softback, cover art and book design by Valerie Coffin Price with particular attention to choice of material, typeface, colour and layout. Order by email to leona@mulfran.co.uk or by post to Mulfran Press at the address opposite. 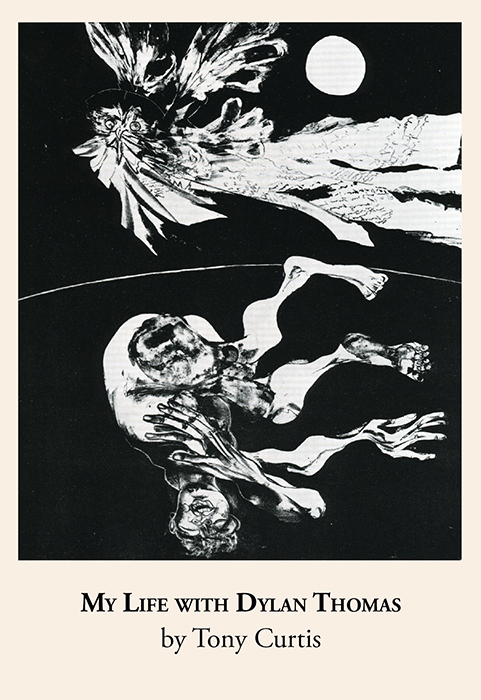 Ten Poems (Mulfran Miniatures 10) by Adnan Al-Sayegh, with illustrations by Kate Hazell with Russian, English and Arabic parallel text on each 2-page opening. Russian translations by Natalya Dubrovina, English translations by Jenny Lewis and Alaa Juma. £6. Order by email to leona@mulfran.co.uk or by post to Mulfran Press at the address opposite. Available from bookshops, online & direct from us. Lesley Saunders' new collection The Walls Have Angels is inspired by her period as poet in residence at a Tudor manor house and the story of two famous guests there, Henry VIII and Anne Boleyn. More about Lesley Saunders and The Walls Have Angels to come. New poems by Iraqi poet Adnan al-Sayegh and new translations of extracts from his epic poem ‘Uruk’s Anthem’ are paired with poems arising form Jenny Lewis’s long-term engagement with the epic of Gilgamesh. 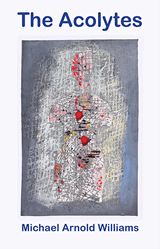 The work here begins to address the balance of feminine and masculine elements across time, often in the context of the horrors of war, but never without a deep appreciation of the cultures of ancient Mesopotamia, modern Iraq and Britain. The CD of recorded poems — each in both English and Arabic — with oud music composed and played by Patricia de Mayo, also features incidental music by Naseer Shamma and the song ‘Anthem for Gilgamesh’ by Jenny Lewis. More about Singing for Inanna to come. Tony Curtis was born in Carmarthen in 1946 and so for seven years shared that town with Dylan Thomas, his family and friends, for whom it was the main railway station and watering-hole on their way from Laugharne to the rest of the world. Wales’s first Professor of Poetry describes being taught, as an undergraduate, by Vernon Watkins at Swansea University in 1967 and he goes on to trace Dylan’s influence on his own writing and the experiences of other writers and artists, including Dannie Abse, Jonah Jones, John Pudney, John Ormond, Glyn Jones, Aeronwy Thomas and Ceri Richards. Tony Curtis has published over thirty books, including eight collections of poetry and has won the Western Mail’s Dylan Thomas Prize and the Dylan Thomas Award for Spoken Poetry, judged by Dannie Abse and Dylan’s daughter Aeronwy. More about Tony Curtis and My Life with Dylan Thomas to come. 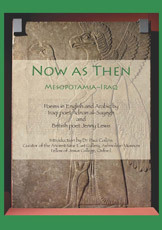 Arising from the 'Writing Mesopotamia' series of readings and workshops at the Ashmolean Museum in April 2013, Now as Then celebrates the history and culture of ancient Mesopotamia and modern Iraq as well as denouncing the devastation of wars ancient, historic and conteporary. Each of the poems appears in both English and Arabic. Photos of four artifacts courtesy Visitors of the Ashmolean Museum. Launch reading at the Asmolean 12.30 Sunday 28 April 2013. More about Adnan al-Sayegh, Jenny Lewis and Now as Then to come. Blackwell's will order from us for you) & direct from us. This book brings a much-published poet his first collection. Peter Daniels has taken a long and circuitous journey towards it. On the way, he has won several competitions including the Arvon, TLS and Ledbury, as well as twice being a winner in the Poetry Business pamphlet competition. 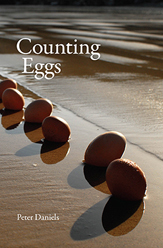 Counting Eggs includes a generous helping of prize-winning and new poems, as well as selected poems from earlier pamphlet publications. More about Peter Daniels and Counting Eggs. Helen Lovelock-Burke grew up on the American Atlantic seaboard and has lived in England for much of her adult life. 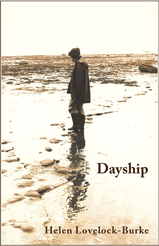 In Dayship, she pays careful attention to what matters most, as well as noting life's occasional sheer strangeness. Some of these poems come from a perspective that can perhaps only be achieved in late maturity. Time — its moments seemingly held in suspension, or as it passes, or the lost times, or those held in memory's safe deposit — is a recurring theme. And where other than here will you find the cross-generational autobiography of a wedding dress? More about Helen Lovelock-Burke and Dayship to come. The courageous and truthful poems in The Acolytes explore the overlapping experiences of family life, love life, and in particular the life and love of science and of art. Inevitably, war touches these lives at many points: a child's experience of the Second World War in the first section; in the central section, the ambiguity and early risks of turning atomic weapons research toward the saving of lives; in the final section, with the poems capturing old men's memories of the Great War. The Acolytes has an Amazon customer review. The Indian edition, Aria, was published by Yeti Books / Monsoon Editions, won the inaugural A K Ramanujan Translation Award, and was named as one of the Best Books of the Year by Outlook magazine, as one of the 'Notable Books of the Year 2009' by Mint / Wall Street Journal and in Frog Books Blogspot. See also a detailed review in Molossus. And another in Himal. This UK edition is substantially expanded to include over fifty new poems in English by Sudeep Sen himself, powerful poetry of love, loss, celebration, grief, art, dance, politics and history. [More about Sudeep Sen and Aria | Anika]. These poems and images respond to the beautiful fire-scarred and fragile landscape of the upland peat bogs of the Black Mountains in Powys. [More about Christopher Meredith and Black Mountains to come]. The earliest story, written thousands of years ago, still has echoes in today's world. In an epic verse drama for youth theatre, Captain Robbie Roberts lies injured in hospital and flits between is life as a soldier in Iraq amd and the mythic world of Mesopotamia. 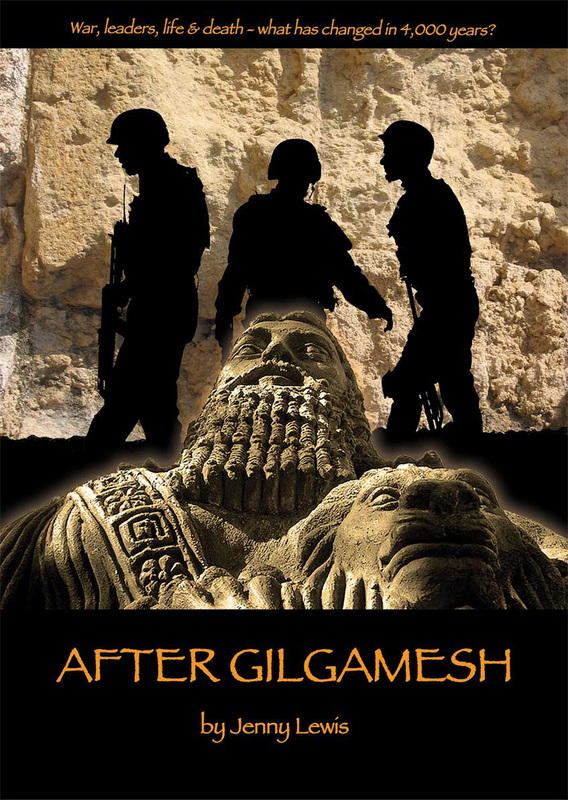 Has anything really changed in 4,000 years? This series of small-format pamphlets (following on from the Vennel Press Brief Pleasures series) includes taster selections by Mulfran poets, by poets who have not yet published a full collection, and by already well-known poets, alongside artists whose images inspired, are inspired by, or respond to the poems. All titles £4 each, post-free direct from Mulfran Press. As with Mulfran books, also available from Blackwell's Bookshop Online. More about Mulfran Miniatures. Available from Blackwell's, other bookshops, & direct from us. With its epithet that the heart should speak, Duncan McGibbon explores the consolations of the poor, of the story, of the fallen. These explorations take the poet on journeys from Our Lady of Geneva through the desolate Bernese Oberland, through Haworth under an eclipse and through the spiritual landscape of Saint Seraphim’s Niszny Novgorod, before returning to Our Lady of Bruges and the heart of his family. More about Duncan McGibbon and The Consolations. Also sold at Castle Stores, Laugharne. This first collection of poems by Lynda Nash is selected from a broader body of work to focus on narratives that individually and collectively illuminate what it was like to grow up in the South Wales valleys in the 1960s and '70s. The stories are grounded in the lived experience of the poet and other children growing up in this particular time and place. More about Lynda Nash and Ashes of a Valleys Childhood.